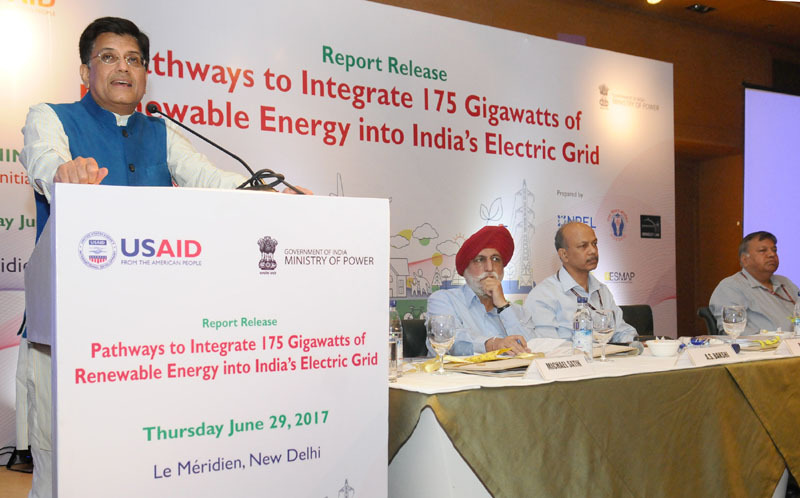 The Minister of State for Power, Coal, New and Renewable Energy and Mines Shri Piyush Goyal addressing at the release of the report Pathways to Integrate 175 Gigawatts of Renewable Energy into Indias Electric Grid- National Study in New Delhi on June 29, 2017. The Secretary, Ministry of Power, Shri P.K. Pujari and other dignitaries are also seen. The study, developed under the U.S.-India bilateral program “Greening the Grid”, confirms the technical and economic viability of integrating 175 gigawatts (GW) of renewable energy into India’s power grid by 2022, and identifies future course of actions that are favorable for such integration. The Government of India in 2015 had set the ambitious target of adding 100 GW of solar energy and 60 GW of wind energy into the country’s energy mix. The second volume of this Report, to be released in July, will take a more in-depth look at system operations in the Western and Southern regions.